This device is used for the transfer of product from one conveyor to a perpendicular conveyor while maintaining load orientation. This device is commonly used when handling larger loads or loads that are on pallets where the direction of flow needs to be maintained. The unit is an integral part of a Power Live Roller (PLR) Conveyor, which can rotate 90 degrees in a clockwise or counter-clockwise direction. Conveyor: 60″, 72″, or 84″ wide Reversing Power Live Roller (PLR) Conveyor. Transition Sections: Provided to match the adjoining Conveyors’ width. 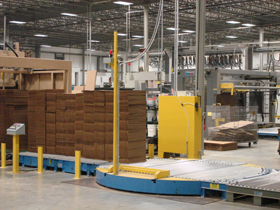 Sections can be non-power or chain-assisted by the adjoining C&M Powered Conveyor. Pivot Post: Center is Floor Mounted with Heavy Duty Flange Mount Bearings. Support Wheels: Five (5) 6” diameter monothane tread wheels, which ride on the floor surface. Surface must be smooth and level to ensure proper operation and to prolong wheel life. Rotational Drive System: One (1) 8″ diameter rubber drive wheel (90 Durometer) which is mounted to a Pivoting Drive Base a captivated Air Mount to compensate for any floor variations. Unit is powered by a 1 hp brakemotor which is totally enclosed, industrial rated, 1750 rpm motor, mounted to an in-line reducer. Reducer is grease filled and maintenance free for a 2-year period. Drive is located in the “side pod” of the device for easy access. Safety Features: Device is equipped with a horn and flashing light that is activated during the rotation of the device. Non-Roller surfaces are covered with a Four-Way safety Walk Plate. Internally mounted photo-eye sensors insure positive load placement before rotation. Controls: Available with Manual, Automatic, or OEM Controls. All rotational positioning is performed through proximity sensors mounted to the base of the device. 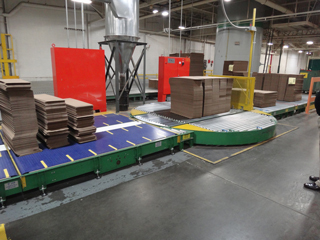 Conveyor includes photo-eye activated controls for both ends. Power: Floor mounted mast with multiple conductor hanging cord(s) which connects to a second Mast mounted to the rotating base of the unit. 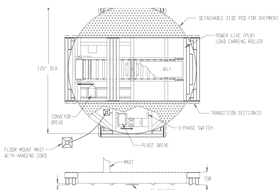 Preassembly: Unit is wired at the factory and (if applicable) plumbed to a junction box. Device Height: 12″ TOR minimum with extensions available for other heights. Rotational Speed: 30, 45, or 60 fpm available. Variable Speed Drive is also available as an option.